Screenflex is happy to partner with the US Air Force reserve unit in Milwaukee’s Mitchell Field to provide privacy for the men and women serving our country. When the Gulf War broke out in the early 90’s, all the troops from the midwest going to Operation Desert Storm were processed through Mitchell Field. Screenflex room dividers were used to create private areas for our soldiers to visit with a chaplain, have their will made, or to get their medical exams. The military use for room dividers doesn’t end there. The US Air Force Academy in Colorado Springs is likewise a huge user of Screenflex products. 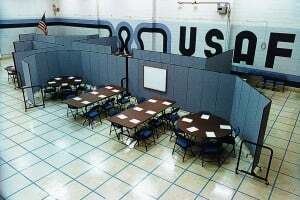 In a recent issue of “Military Club And Hospitality,” you could see several Screenflex Portable Room Dividers in the mess hall, helping the facility folks make a large space more efficient. The versatility and capabilities of Screenflex room dividers to transform any room into a more usable space are what sets us apart from competitors. Self-leveling caster wheels ensure a level room divider at all times.